Accessible Sheffield is a partnership between the Access Card (Nimbus), Disability Sheffield, AccessAble, Sheffield Carers Centre and Sheffield City Council helping make a more equitable and accessible City for disabled people and carers. AccessAble (previously DisabledGo) is working in partnership with Sheffield City Council to provide an access guide to over 1000 venues covering Sheffield. AccessAble provides information on all sorts of venues such as: shops, restaurants, leisure centres, hotels, parks, places of worship, resource centres and many more. Following Sheffield’s hosting of the Special Olympics in 2017 AccessAble put together a detailed guide listing all Special Olympic venues and is available still, with the rest of our special city guides. The Sheffield Guides also have room for user feedback offering added value and reassurance from peoples lived experience in addition to the technical information available from the access auditors. The guides are totally free to use and of interest to both residents and visitors. Here is a link to the Sheffield Guides which are part of the Accessible Sheffield Project. They are available in paper based format too. This then informs providers quickly and discreetly about the support you need and may gain you access to things like concessionary ticket prices and complex reasonable adjustments without having to go into loads of personal detail. Some organisations are now using the card to passport the need to provide evidence. Where this is the case the Access Card is an optional way to simplify your bookings with several providers. Applying online is easy – visit this link: www.accesscard.org.uk/apply and complete the application form. You can upload all of your supporting information or send it through later. To qualify for the card at the discounted rate of £10, as a Sheffield resident, enter the code DisabilitySheffield when you get toward the end of the form. 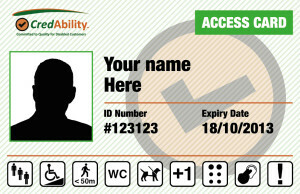 Similar to the Access Card the Carer Card informs providers quickly and discreetly about the support you need as a Carer and may gain you access to concessionary goods and services without having to go into lots of confidential personal detail. The Carer Card has been designed as a specific response to the barriers that carers face and to recognise and reward carers for the work that they do which is mostly unpaid. 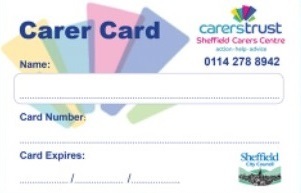 Sheffield City Council have funded this project which will enable carers for the first time to have a card that they can show to providers in recognition of their caring role. You can apply for the Carer Card through The Carers Centre and complete the application form. Find a list of participating retailers here or watch out for the stickers in shop windows……and please do carry your Carer Card wherever you go as you never know! Our role is to provide expert local advice and guidance on the Accessible Sheffield project. We will be responsible for engaging with individual disabled people and carers and providing additional support and training to businesses who would like to make their service more accessible for disabled people. Nimbus is one of the country’s leading providers of disability related advice and support to business. They provide a wide range of training and consultancy services and are also the creators of the national and local schemes CredAbility Quality Assurance (see CredAbility Flyer), the Access Card and the Carer Card. Please see further details below under Providers, Services & Shops. Sheffield Carers Centre know that being a carer can be an enormous responsibility, and can take its toll on your career, your family and every other aspect of your life. Their services are there to help you find those services that can make your life as a carer a little easier and to reassure you that you are not alone in your caring, but part of a larger community of carers in Sheffield and across the country. At Sheffield Carers Centre they offer emotional support and help in getting services. They also conduct Carers Needs Assessments, which evaluate what help you need in order to make your caring situation easier, and less stressful. Please do not hesitate to give them a ring if you are interested in this. Sheffield City Council has set up the Disability Hub, part of the “Equality Network Hub” for individuals and organisations to work with the Council and partners to take action on equality and fairness issues. Are you are looking to take your pro-active commitment to disabled customers to a different level? If so, then we can help with signposting and advice. Together we can be part of a growing movement which takes pride in its commitment to disabled customers, so please join in!